Meeting the Miller brothers is an experience. Their syncopated, rapid fire manner of speaking in tandem, each starting and finishing sentences while the other fills in the gaps takes some mental juggling at first. 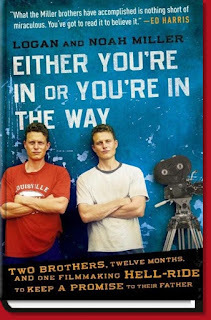 But the auditorily adept listener eventually finds the rhythm and understands that as they say in their new book, Either You're In or You're In The Way, for Logan and Noah Miller, "Bro is me and I am Bro". Once you grok the Miller's you're in. Since first meeting the Miller brothers last November at a Florida film festival, we have been fans. Following their career distantly via websites, newspaper clippings, interviews and a couple of hurriedly exchanged e-mails, we have watched the progress of both their film, Touching Home, and this highly anticipated book. It would be a mistake for anyone to read this book as only the retelling of the trials and tribulations of first time film-makers. Or, as a how-to or how-not-to book of writing, producing, directing and starring in a fictionalized version of your life story. Many readers will unfortunately take that approach and thereby miss the true heart of the book. As you delve into Either You're In or You're In The Way, you begin to realize that Logan and Noah Miller are taking you on a journey. A journey that begins with the love that the twin brothers have for their alcoholic father and continues with them seeking closure following his death by succesfully telling their story on-screen. The story is bittersweet, with alternating moments of hilarity, tension, and heartbreak, but through it all the bros keep their focus on the ultimate goal and press forward with passion, heart, and dogged determination. Ultimately though, this story is about much more than two brothers trying to acheive their dream. It is about refusing to accept anything other than solutions to problems. It is about dealing with the micro by understanding the macro. It is about an unerring commitment to quality and not accepting anything less. It is a manifesto on how to live life on your own terms and stay true to your values. Much like Scratch Beginnings, another offering from HarperCollins Publishers last year, Either You're In or You're In The Way should be required reading for every high school student in the country. Although vastly different in scope and purpose, both books remind us that the American Dream is alive and well. As Logan and Noah Miller put it so well, somewhere around page 195, "To those who no longer believe in the American Dream, read this, and say otherwise".